Location of the Buffalo River and Watershed. The Buffalo River, located in Northern Arkansas, was the first National River to be designated in the United States. The Buffalo River is 153 miles (246 km) long. The lower 135 miles (217 km) flow within the boundaries of an area managed by the National Park Service, where the stream is designated the Buffalo National River. The river flows through Newton, Searcy, Marion, and Baxter Counties, from west to east. The river originates in the highest part of Boston Mountains of the Ozarks, flows out onto the Springfield Plateau near the historic community of Erbie, and finally crosses a portion of the Salem Plateau just before joining the White River. The Park is home to the state's only elk herd. The upper section of the river in the Ozark National Forest is managed by the U.S. Forest Service and is designated as a National Scenic River and a National Wild River; that section is not part of the area managed as a park by the Park Service, but is managed as a part of the Ozark National Forest. The Buffalo National River was established by an Act of Congress on March 1, 1972, ending the recurring plans of the U.S. Army Corps of Engineers to construct one or more dams on the river. The National River designation protects natural rivers from industrial uses, impoundments and other obstructions that may change the natural character of the river or disrupt the natural habitat for the flora and fauna that live in or near the river. At a point about 15 miles (24 km) above the Park boundary in Newton County, Arkansas, the Buffalo River begins as the Main Prong of Big Buffalo Creek. The river flows north through Boxley to Ponca, where it then begins an eastward trek across northern Arkansas to its confluence with the White River on the Marion-Baxter County line. Advanced canoeists and kayakers often refer to the 15-mile (24 km) section upriver from Boxley as the Hailstone River. This extremely challenging section of the river is floatable only during periods of high water and should be attempted only by those with solid whitewater skills. Along the upper river, the gradient is steep and the water is fast, leveling and slowing as the river runs its course. The upper section has most of the whitewater rapids to be found along the river, and features dramatic topography including sink holes and caves, springs, and waterfalls, over 500-foot (150 m) tall sandstone and limestone bluffs, and many rock formations. At one point, a 0.65-mile (1.05 km) hike from the river up a narrow, boxed canyon leads to a 209-foot (64 m) waterfall,  Hemmed-In-Hollow Falls, the highest of its kind between the Southern Appalachians and the Rockies. The river's current also gives life to well over 300 species of fish , insects, freshwater mussels, and aquatic plants. The Buffalo National River is a popular camping, canoeing, and fishing destination. Visitors may bring their own canoes or rent from several independent concessioners. Camping is generally allowed throughout the park with the following exceptions: the Hemmed-in-Hollow area, on Big Bluff, in historical structures, on private property within the park, or within 100 feet (30 m) of any trail or watercourse. Camping is, however, permitted on gravel bars and sand bars along the river. In addition, the National Park Service has a number of "developed" campgrounds along the river. 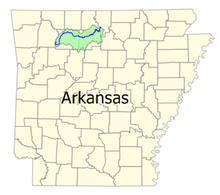 The National Park Service headquarters for the Buffalo National River is located in Harrison, Arkansas. 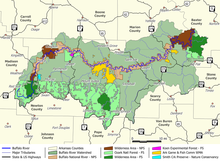 Buffalo River Watershed including National River and other State Government, Federal Government, and Nature Conservancy Managed Lands. Click to enlarge. Lost Valley - located on Arkansas Highway 43 between Arkansas 21 and Ponca. Pruitt Ranger Station – is on Arkansas Highway 7 at the top of the hill overlooking the picnic area and foot access to the river. For boat access, you need to cross the high bridge on Arkansas 7 and use Pruitt Landing. Maumee South – is on the south side of the river and is accessed from an unimproved road beyond the end of the pavement on County Road 49. ^ "Buffalo National River". National Park Service. January 16, 2013. Retrieved February 9, 2013. ^ Ernst, Tim (Nov. 2002). Arkansas Waterfalls Guidebook, Cloudland.net, 224 pp. ISBN 1-882906-48-9. ^ Petersen, James C. (2005). Fishes of Buffalo National River. Reston, VA: U.S. Geological Survey. Retrieved 31 January 2018. The Buffalo Flows: The Story of Our First National River. University of Arkansas Press, 2009. 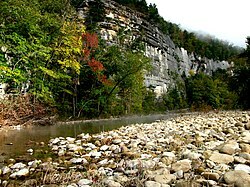 Wikimedia Commons has media related to Buffalo National River.